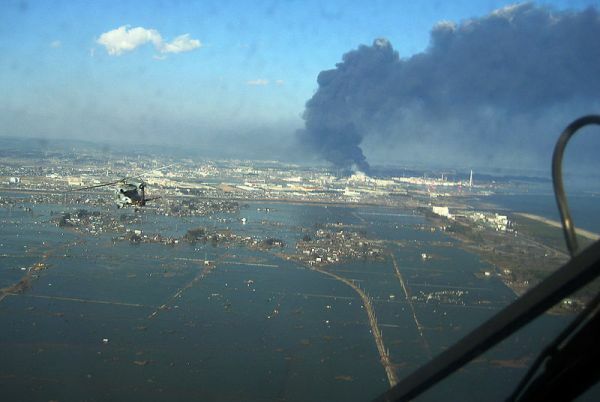 Developments in the wake of Japan’s triple disasters: earthquake, tsunami, nuclear. The US Geological Survey upgraded Japan’s 11 March earthquake today to 9.0 from 8.9. Based on Japan’s huge network of 1,200 GPS monitoring stations, the quake shifted the country’s coastline some 4 meters / 13 feet to the east, and knocked Earth of its axis by 16.5 centimeters / 6.5 inches, shortening Earth’s days by about 1.8 millionths of a second. The BBC reports that geographical shift will require that GPS-based driving maps be updated, and nautical charts, too, since water depths have been changed. Furthermore, much of the flooded coastline appears to have subsided permanently—or as permanently as anything ever is on this restless planet—and will not be dry land again anytime in the near future. Here are before and after images of the the city of Ishinomaki in Miyagi Prefecture near the quake’s epicenter. The “after” shot, above, was taken three days after the quake. Water still inundated the city. The “before” shot was from August 2008. Both are false color images: water is dark blue; vegetated land is red; dirt is tan; buildings are silver. You can see how much of the vegetation in the agricultural fields has been stripped away. This is sure to have an impact on Japan’s food production, perhaps for a while, since saltwater inundation is tough on farmlands. If people in the area depend on aquifers for fresh water, those could be affected by saltwater flooding too. 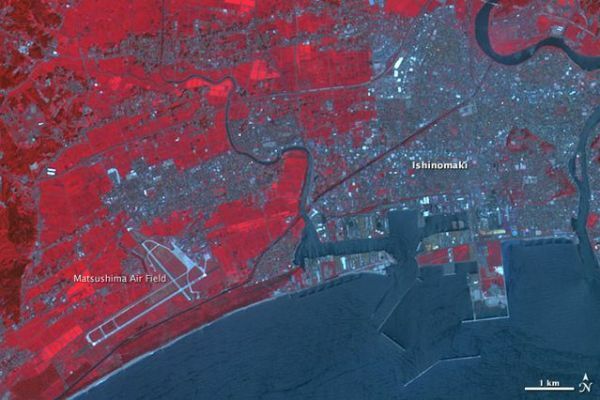 You can also see the extensive flooding around the Matsushima Air Base in the lower left corner of the image. It’s not at all clear, at this point, just what pollution or toxins may have been unleashed from the air base and nearby industries. Credit: US Navy, via Wikimedia Commons. 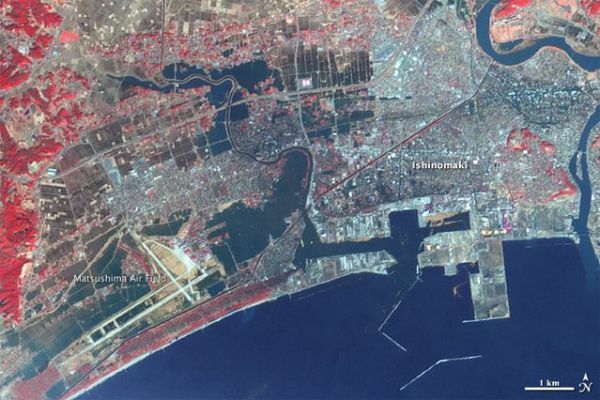 A raging fire at the Cosmo Energy refinery in Chiba that began March 11 touched off an overnight fire at the neighboring Chisso polyethylene and polypropylene plant. Chisso says that none of its workers were injured and that damage to the facility is relatively light. 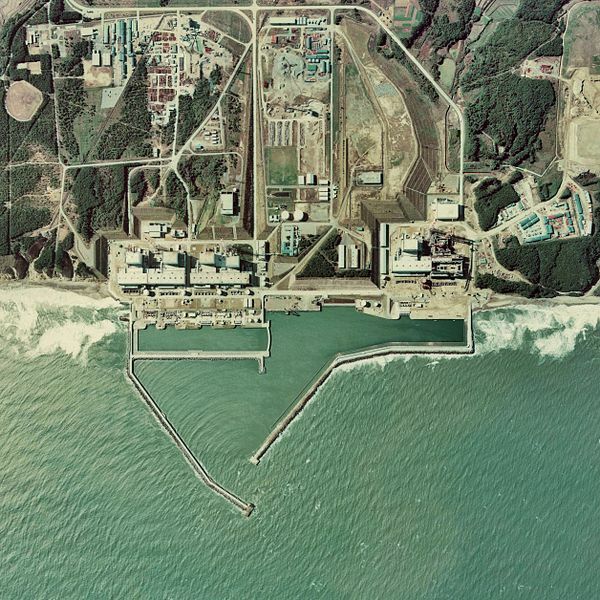 Polysilicon producer Tokuyama has a subsidiary… located in [an area] devastated by the tsunami. Tokuyama says it is assessing damage to the subsidiary and to its facilities elsewhere in Japan. Chemical manufacturer Tosoh says its staff in the Tohoku area is safe, including the staff of a plant in the town of Ishinomaki, which was largely destroyed by the tsunami. This facility was flooded and Tosoh says the extent of the damage is unclear. [T]he right-hand image is a stereoscopic “anaglyph” created from data in MISR’s [Multi-angle Imaging SpectroRadiometer aboard NASA’s Terra spacecraft] red spectral band, and generated by displaying the 46-degree backward view in red and 60-degree backward view in cyan. The separation between the red and cyan images is known as stereo parallax, and is related to the height of the observed features above the surface. Viewing the anaglyph with red-cyan glasses (red filter over the left eye) gives a perception of height. No separation is visible for the coastline, which is at sea level, but the clouds and plume are distinctly elevated. The height of the plume is estimated to be about 2 kilometers (1.2 miles), at a similar altitude as the nearby clouds. Fukushima Daiichi Nuclear Power Plant. Credit: Japan Ministry of Land, Infrastructure and Transport, AirPhoto, via Wikimedia Commons. Most alarming of all is what’s happening at the Fukushima Daiichi’s reactor number 3 that exploded yesterday. In the current catalogue of bad possibilities, this one is the Mother of all Bad Possibilities, since the reactor uses a mixed oxide fuel, known as MOX, made with reprocessed plutonium and uranium oxides. If any of that gets out, the situation gets much worse faster, since inhaling plutonium is lethal, even tiny bits of it.